No Electricity At Ghanair Airport Offices -Bills Unpaid! 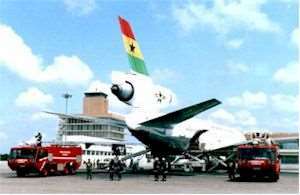 Investigations at the Kotoka International Airport (KIA) have revealed that the Sales and Reservation offices of the national carrier, Ghana Airways has been without electricity power for the past two weeks, due to nonpayment of bills. This situation has resulted in workers not working to their optimum because computers, air conditioners and other gadgets that use electricity have been grounded for these two weeks. According to some workers on duty that the Business Chronicle spoke to, they could not do any meaningful work as their computers and air conditioners had been grounded while all calls to management to solve the problem had fallen on deaf years. A visit yesterday to their offices at the KIA, found officers of the airline working in the dark during the night shift while others were outside, doing nothing. Sources available to this paper indicated that power supply to the Ghana Airways office at the port was cut because of a huge debt the airline owed the Electricity Company of Ghana. The offices of other airlines, including Lufthansa, City Link among others on the same premises, had electricity supply throughout the day. Speaking to the paper, a worker who wanted to remain anonymous said these were some of the little factors that mitigated the smooth transformation of the airline into a world-class airline. Ghana Airways has recently been beset with very serous problems, which have culminated in the removal of its former Chief Executive Officer (CEO), Mr. Philip Owusu. Meanwhile, all efforts to contact the management of the airline to react to the story proved futile.